It is 150 years since the beginning of the Meiji era in Japan and 160 since the country finally opened up to foreign trading after years of isolation. A marquetry commode by Emile Gallé – estimated at €200,000-300,000 at the Japonisme sale held at Christie’s Paris. Image copyright: Christie’s Images Ltd, 2018. This realignment, through treaties with various European countries, brought profound changes to east and west as the secrets of Japanese culture were revealed, unleashing an occidental pursuit of all things Japanese. 'Japonisme', the term coined to describe this new fashion, was first used in articles in the West in the 1870s. It is also employed by Christie's as the title for a sale celebrating the effect that exposure to Japan had on applied and fine arts in France and beyond. Staged in its Paris rooms on November 15, it features a selection of Japanese-influenced objects, art and literature from the final quarter of the 19th century into the Art Nouveau era. This is a select offering of just 75 lots that are a mix of European works that show Japanese influence or inspiration and pieces imported from Japan by the new afficionado dealers and collectors. Several lots have provenance to some of these influential names of the period: dealers such as Siegfried Bing, writers like the Goncourt Brothers or artists influenced by Japanese woodblock prints. Pictured here are seven lots from the sale, two of them early imports from Japan and five giving a taste of the different categories influenced by the Japanese aesthetic. This imposing 1880s gilt bronze mounted aquarium on a gilt bronze and champlévé enamel pedestal stands 5ft (1.5m) high overall. It is the creation of two of the major French talents of the period: the highly skilled bronze founder Ferdinand Barbedienne and the industrial designer Edouard Lièvre, who was renowned for his Sino-Japanese inspired works. A mounted aquarium on a gilt bronze aquarium by Ferdinand Barbedienne and Edouard Lièvre – estimated at €100,000-200,000 at Christie’s Paris. Image copyright: Christie’s Images Ltd, 2018. This is a typical luxury object, incorporating Chinese Shou characters in the mounts to the bowl and standing on elephant-head feet. It has an estimate of €100,000-200,000 in Christie's Japonisme sale on November 15. This 19th century Edo period inkwell has a provenance to Edmond de Goncourt, one of two brothers who were famous writers and key proponents of Japonisme in France. An Edo period inkwell with a provenance to Edmond de Goncourt – estimated at €3000-4000 at Christie’s Paris. Image copyright: Christie’s Images Ltd, 2018. It comprises three pieces: a figure of Daruma with detachable head which serves as the inkwell, accompanied by two small bronze animals, a cricket and a praying mantis, which form pen rests, all set on a European faience tray. It is estimated at €3000-4000 in Christie's Japonisme sale on November 15. A highlight of the Christie's November 15 Japonisme sale is this marquetry commode by the famous and multi-talented designer Emile Gallé, who was one of the prime exponents of the Art Nouveau style in France. Named Nocturne (most of Gallé's creations have poetic titles), it makes use of his signature sinuously curved naturalistic marquetry in wood and mother of pearl which was influenced by the stylised naturalism seen on many Japanese artefacts. The cabinet is part of a small group of furniture pieces commissioned in c.1900-04 from Galle by a longstanding patron, the magistrate Henry Hirsch. It has an estimate of €200,000-300,000. An 18th century Japanese Chuban woodblock print by the artist Sukuki Harunobu, featuring two Japanese beauties or bijin in a winter snowscape, is among the lots at the Christie’s sale in Paris. A Japanese Chuban woodblock print by Sukuki Harunobu – estimated at €20,000-30,000 at Christie’s Paris. Image copyright: Christie’s Images Ltd, 2018. It probably formerly belonged to Hayashi Tadamasa, the Japanese art dealer who settled in Paris from the 1870s and is regarded as a prime contributor to the knowledge of Japanese art, particularly prints, in Europe. The 10 x 7in (26.5 x 19.5cm) signed print has a guide of €20,000-30,000 in Christie's November 15 Japonisme sale. The debt to Japanese woodblock prints is all too clear in this album of lithographs by Henry Rivière titled Les Trente-Six Vues de la Tour Eiffel. ‘Les Trente-Six Vues de la Tour Eiffel’, an album of lithographs by Henry Rivière – estimated at €6000-8000 at Christie’s Paris. Image copyright: Christie’s Images Ltd, 2018. The publication, with a cover by Charles Baron, was limited to 500 examples, of which this is numbered 27 and signed on the colophon by the artist. The estimate in Christie's November 15 Japonisme sale is €6000-8000. Le Japon Artistique (Artistic Japan) was an influential illustrated monthly review published in French, German and English which was founded by the dealer Siegfried Bing. It ran from 1888-91 and was important for diffusing information about the newly fashionable Japanese art. One of the six bound volumes of the monthly review ‘Le Japon Artistique’ (Artistic Japan) which will be offered as a single lot at Christie’s – estimated at €2000-3000. Image copyright: Christie’s Images Ltd, 2018. The 35 editions, offered here in six bound volumes, were published by Samson Lowe, Marston, Searle and Rivington in London. They belonged to Frederick York Powell, an English historian and scholar and bear his bookplate. The estimate is €2000-3000. This 16.5 x 11.75in (42 x 30 cm) glazed earthenware plaque decorated with a view of mount Fuji and a bamboo tree is by the French ceramicist Clément Massier. It dates from c.1900 and is probably inspired by Hokusai's famous series. 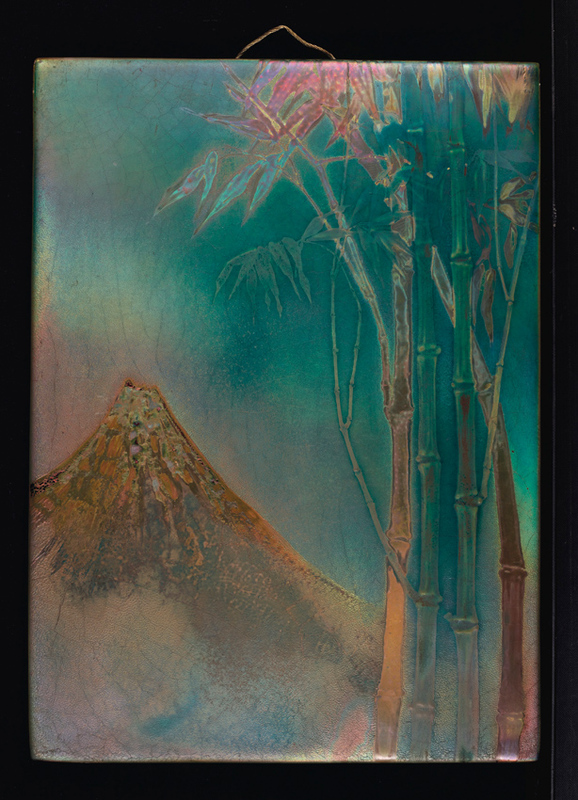 A plaque by Clément Massier decorated with a view of mount Fuji– estimated at €8000-12,000 at Christie’s Paris. Image copyright: Christie’s Images Ltd, 2018. It has a provenance to Siegfried Bing's famous gallery owned by the dealer in Japanese works of art who, in 1895, wanting to change the direction of his rue de Provence shop to reflect the new pan-European style, renamed it as the Maison de l'Art Nouveau with an interior by Henry Van de Velde. The plaque bears a Maison de l'Art Nouveau label to the reverse and is estimated at €8000-12,000 in Christie's Japonisme sale.